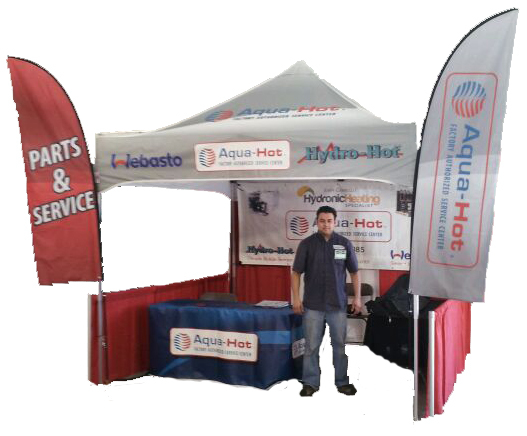 John Carrillo Hydronic Heating Specialist provides service and repair on Aqua Hot, Hydro Hot, and Webasto heating systems at RV Rallies, RV Shows, and On-site locations. The services are provided at FMCA National and Area Rally’s. They are also provided at RV shows and at the Good Sam Rally’s. The On-site services are by appointment only. If you are noticing any of the following issues, send a Request for technical assistance and we will be happy to help you. Also any other questions, comments or concerns besides the items below please feel free to get in touch with us! John has worked in the industry for over 16 years. He attends rallies all over the United States, helping people service, repair, tech support. Also tank, and full heater rebuilds, and with refurbished and new hydronic heating system installs. John Carrillo an RV Mobile Authorized Service Center/Dealer for Aqua-Hot Heating Systems. John also specializes in the DBW 2010 & 2020 Webasto Thermosystems.